It is day 2 of the DEM team's deployment to support the Westchester County Department of Emergency Services. In this em4SF Blog our Deputy Director, Rob Dudgeon, shares his sentiment about two of the guiding principles of emergency management: step in where needed and support each other; and always learn. This em4SF Blog comes to us by way of Westchester County, New York, where our Deputy Director Rob Dudgeon and a team of fellow DEM'ers have been deployed to help the Westchester County Department of Emergency Services support its community's recovery from Hurricane Sandy. In this Blog, Rob Dudgeon shares his thoughts and observations about team's first day on the job. In this em4SF Blog, we are taking a look back to late August (on the eve of the hustle and bustle that our fall outreach brings) and are enjoying the unique perspective from a San Francisco neophyte on Burning Man. Our author is Polly Zebrowsk who joined DEM as an intern last Spring. Polly came to us by way of passion for emergency management through her studies in emergency management at Tulane University. Last week 9.4 million people in California participated in the largest earthquake drill in the state...in the country…in the world! Now in its fourth year, ShakeOut aims to arm Californians with the knowledge of what to do during an earthquake, which is to drop, cover and hold-on. The Loma Prieta Earthquake anniversary and ShakeOut (the annual statewide earthquake drill that takes place the third Thursday of October) make October a very earthquake-hazard-centric month. However, much like the nature of life, there many walks of hazard--including man-made ones like cyber terrorism. So, along with earthquake month, October also is National Cyber Security Awareness Month. Today marks the 23rd anniversary of the Loma Prieta earthquake. Although this earthquake may not be one of recent memory, it still remains one of the most significant disasters to have occurred in the Bay Area (and California at large). And the memories from those of us who experience the earthquake first hand are fresh, which is why we are dedicating this em4SF blog today, and through the rest of this commemorative week, to story telling around Loma Prieta Earthquake. 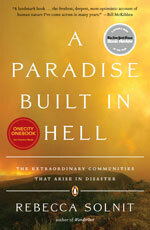 In this em4SF blog, DEM's Recovery Planner Kay Vasilyeva provides a book review of the San Francisco's One City One Book selection: A Paradise Built in Hell, written by Rebecca Solnit. We are particularly excited about this selection because of direct connection it provides us to work we do at DEM to support San Francisco's resilience. SF Heroes LIVE Community Preparedness Game Starts in 2 Days! Get prepared. Win prizes. Are you prepared for emergencies? How about your family and your neighborhood? The fact is that most of us who live and work in the San Francisco Bay Area aren’t. Why? For some, it’s too much trouble. For some, they just don’t know how. And some are just plain scared and just don’t want to think about it.